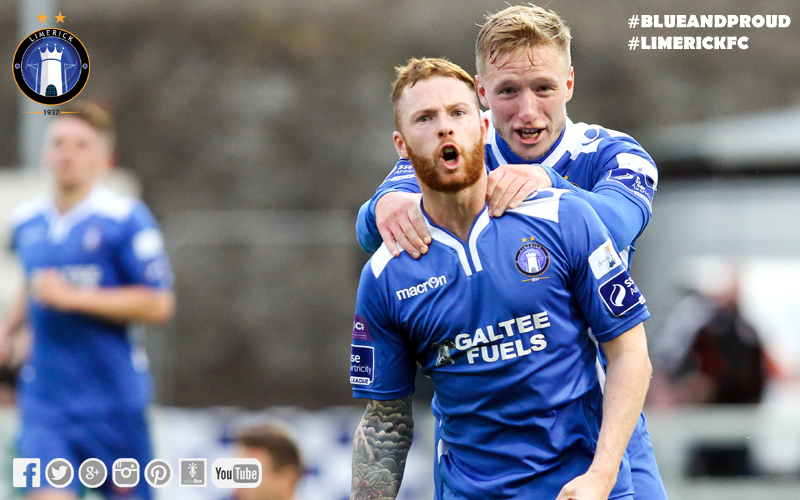 Ten-man Limerick produced an incredible fightback to beat Bohemians 4-3 in a thrilling SSE Airtricity League Premier Division match at the Markets Field on Saturday night. After an even opening quarter to the game, Freddy Hall produced heroics to deny Jake Kelly from ten-yards, the ‘keeper getting down superbly to stop a powerful shot. And that laid the platform for Limerick to take the lead minutes later when Ian Turner’s delivery from the right was met by an unstoppable header from Vinny Faherty, who made it three in two games. Bohs, though, were level before the break when Kelly’s corner into the six-yard box was met by Ismahil Akinade from close range. Moments into the second half, Bohs threatened when Kelly and Karl Moore set up Roberto Lopes but under pressure he shot wide. Then Akinade burst past Patrick Kanyuka, drawing the foul and a red card from referee Seán Grant. Kelly stood up and put Hall the wrong way. Limerick did not lie down and levelled through Seán Russell’s stunning strike on the hour-mark, and only a fantastic Dean Delany save stopped them from taking the lead through Dean Clarke. Against the run of play, Bohs retook the lead through Kelly on the break, but still Limerick refused to lie down and they levelled through Lee-J Lynch’s drive on 72 minutes. Then they were awarded a penalty and up stood Shane Tracy whose strike hit the post and went in off Delany’s back. Bohs piled on the pressure late on but, through five minutes of injury-time, Limerick held firm to record a priceless win as they made it two in a row. Limerick manager Martin Russell stuck with the same team that lined out in the win over Sligo Rovers seven days earlier. Bohs made four changes from the side which lost 4-0 in Cork. Moore, Jason Caffrey, Anto Murphy and Paddy Kavanagh came in to replace Eoin Wearen, Robbie Creevy, Stephen Best and Adam Evans. Bohs pressed early on and had a couple of set-pieces from former Dundalk man Kelly, but it was Limerick that posed the first real threat on eight minutes. Clarke did brilliantly down the left, getting past Murphy and into the box; his pull-back came to Shane Duggan who fed Lynch, with his delivery bravely attacked by Clarke but under pressure he headed off target. On the quarter-hour, it was Tracy that caused problems down the left, his wicked delivery cleared to the edge of the box where Lynch fed Paul O’Conor. His low strike from 20-yards was almost diverted in by the sliding Clarke but the ball flew wide. Then Kelly got through on goal and rounded the ‘keeper, but pushed wide out on the left his cross in was gathered by Hall. The 25-year-old then thought he had scored when an Akinade cross fell to his feet ten-yards out but his low strike was superbly stopped by a strong hand from the Bermudan. And then Limerick broke the deadlock when Turner’s cross from the right was met by a bullet header by Faherty inside the box, the striker giving Delaney no hope as it hit the top corner. On 34 minutes, Bohemians looked to reply and, after a Moore cross from the left, Kavanagh picked up the possession and turned before curling a shot just over. Then a long Murphy throw-in fell to Derek Prendergast in the box but he blasted wide. But Bohs did level shortly after. A free-kick was cleared behind and the resulting corner from Kelly was into the six-yard box where Akinade was on hand to tap in. At the start of the second half, Limerick were on the back-foot straight away when Bohs attacked through Kelly, who combined with Moore to setup Lopes but under pressure from Tracy he fired wide. Then came Kanyuka’s dismissal and Kelly’s penalty conversion as the game turned against the hosts. Limerick looked for a way back into the game and Clarke was through on goal soon after, but his attempted lob was blocked by the out-rushing Delany. Limerick, though, equalised in stunning fashion on 59 minutes through Russell – only on the pitch – who picked up possession 25-yards out and drove to the net past a motionless Delany. And the ten men were almost in front six minutes later when Russell played the ball over the top to Clarke who beat Jason Caffrey and hit a shot that was wonderfully touched away by the ‘keeper. On 68 minutes, Duggan’s strike was pushed away by Delany and appeals for a penalty, after a nudge on Clarke, were turned down. Bohs then hit the front on the break through Kelly, who finished coolly. Limerick, though, were ahead within seven minutes with Lynch hitting a second leveller with a drive after Tracy’s free-kick fell to him to him on the edge of the box. 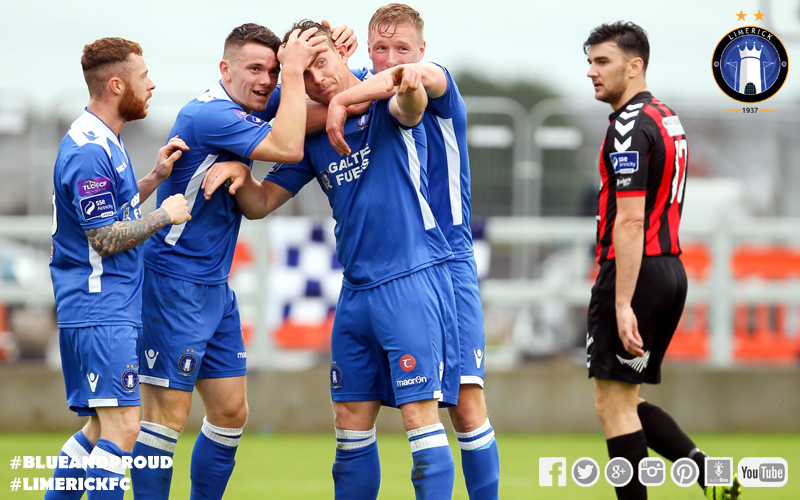 And then they were awarded a penalty after Clarke was fouled by Robbie Creevy. Up stood Tracy who struck the ball off the post, with it hitting Delany’s back and going in. Faherty could have made it 5-3 but he was denied by Delany, and at the other end Adam Evans and Dave Mulcahy had chances. But Limerick held on, to record an invaluable victory. Limerick: Freddy Hall, Shaun Kelly, Patrick Kanyuka, Robbie Williams, Shane Tracy, Shane Duggan ©, Paul O’Conor, Ian Turner (Seán Russell 56), Lee-J Lynch, Dean Clarke (Darragh Rainsford 86), Vinny Faherty. Goals: V Faherty (27), S Russell (59), L Lynch (72), S Tracy (75 pen). Booked: R Williams (4), L Lynch (75). Unused Subs: Tommy Holland (GK), Tony Whitehead, Paudie O’Connor, Ross Mann, Cyril Guedjé. Bohemians: Dean Delany, Anto Murphy (Robbie Creevy 70), Derek Prendergast, Dave Mulcahy, Jason Caffrey, Roberto Lopes ©, Keith Buckley (Kealan Dillon 88), Jake Kelly, Paddy Kavanagh, Karl Moore (Adam Evans 70), Ismahil Akinade. Goals: I Akinade (39), J Kelly (50 pen, 69). Booked: I Akinade (60), R Creevy (74), K Dillon (89). Unused Subs: Dean Mahon (GK), Jason Byrne, James O’Brien, Stephen Best. Referee: Seán Grant (Wexford). Attendance: 822 (Official).